A bar which does food, right on the edge of [Greenwich Park]?. 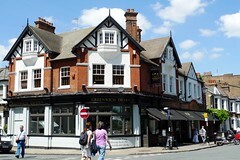 It was renamed in 2011 from The Greenwich Park Bar and Grill, though with no apparent change to the management. It serves meals and snacks, mostly of the burger and fries variety. Food was fresh, nicely cooked and arrived quickly. Apparently it also serves Kobe beef burgers. The cocktail menu was extensive. [Tamsin]? failed to check out the upstairs which apparently has treehouse-themed decor. Food is served noon-6pm Sunday to Thursday, and noon-8pm Friday and Saturday. Last visited by [Tamsin]?, January 2008. Opening hours and food times taken from the Greenwich Park Bar And Grill website, January 2008. Last edited 2013-05-10 07:17:59 (version 11; diff). List all versions. Page last edited 2013-05-10 07:17:59 (version 11).